For the American football player, see Jay Hughes (American football). James Jay Hughes (January 22, 1874 – June 2, 1924) was an American Major League Baseball pitcher, who played four seasons from 1898 to 1902. Hughes was born in Sacramento, California. He attracted attention in 1897 when he threw a three hit shutout during a west coast exhibition game against the famed Baltimore Orioles, a team featuring such notable baseball stars as Wilbert Robinson, John McGraw, Hughie Jennings, Willie Keeler, and Joe Kelley. 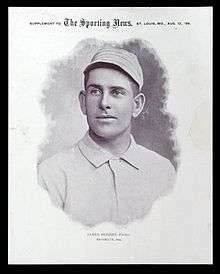 Orioles Manager Ned Hanlon hired him and brought him east, where he had four excellent seasons, including a league-leading 28-6 mark with the 1899 Brooklyn Superbas. He pitched a no-hitter on April 22, 1898 (another no-hitter, by Cincinnati's Ted Breitenstein, was thrown the same day, marking the first time that two no-hitters were thrown on the same day). Hughes was transferred to the Brooklyn Superbas in 1899; the Orioles and Superbas were both owned by the same group of individuals. Jennings, Keeler, and several other key Orioles were transferred, including manager Ned Hanlon, who had an ownership stake. The owners wanted to transfer McGraw and Robinson as well, but they refused to leave due to their business interests and family in Baltimore. Preferring to play on the west coast, he joined the Pacific Coast League in 1903. As a Sacramento native, he hated pitching in the East, and on several occasions refused to sign contracts with eastern clubs so he could remain on the west coast. In 1903, playing for the Seattle Rainiers, he tied Doc Newton for the lead in wins with 34, including 12 in a row from September 8 through November 4. He pitched there until a back injury ended his career. He died when he fell from a train in Sacramento, fracturing his skull. He was laid to rest at St. Joseph Cemetery in Sacramento. His older brother, Mickey Hughes, won 25 games for the 1888 Brooklyn Bridegrooms. This article is issued from Wikipedia - version of the 4/11/2016. The text is available under the Creative Commons Attribution/Share Alike but additional terms may apply for the media files.